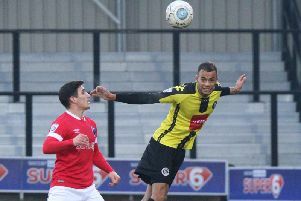 Harrogate Town manager Simon Weaver expects his players to raise their game when they entertain Salford City live on television on Wednesday night. 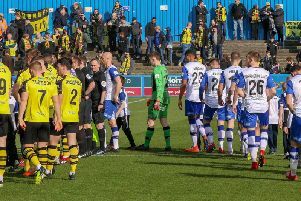 BT Sport cameras will broadcast the midweek clash between the two National League promotion hopefuls into homes across the country. And given how well his side have played during their previous two televised fixtures this term, Weaver is confident that they will thrive under the spotlight once again. "We played very well away at Fylde and then at home to Hartlepool when the cameras were there," he said. "The Hartlepool performance was up there with our best all season. I think that, as a group, the players have shown that they can handle the pressure of playing live on television. "There are a lot of lads in this squad who enjoy the bigger stage and aren't fazed by it. Quite the opposite, I think they raise their game and I think that's what we'll see on Wednesday. "I believe it's important to embrace these opportunities and use them as a positive, which is what we've done in the past, rather than shying away and going into our shells. "It's a massive game against Salford with both teams going for promotion and obviously I am hoping that we rise to the occasion once again." Both sides head into Wednesday's fixture in decent form, with City fourth in the table and Town two places and three points behind them. The Ammies had won four in a row without conceding a goal prior to Saturday's stalemate at home to Barnet. Weaver's men have lost just one of their previous seven, though it took a second-half fight-back to rescue a point at Barrow last time out. And having seen a trio of substitutes come off the bench to help inspire that revival in Cumbria, the Wetherby Road chief admits he has plenty to consider when it comes to picking his starting line-up for the Salford game. "All the lads who came off the bench on Saturday did very well and made an impression on the game,"Weaver added. "It's certainly given me food for thought ahead of the Salford match. Those three [Joe Leesley, Jack Senior and Aaron Williams] are all in contention. "We've named the same 11 for seven games in a row because those players were doing their jobs and we've been getting results. I don't believe in change for the sake of it. "The substitutions at Barrow were all warranted and I think that they made a difference. I'd rather be too bold than not make a decision or hesitate when one needs to be made. "At this stage of the season, it's our job to be looking out for a dip in the energy levels and to tweak things where required. We'll utilise the squad to help ensure that we have 11 players out there who are all capable of performing at 100 per cent." Wednesday's clash at the CNG Stadium kicks-off at 7.45pm. Tickets for the game have sold out.